Right angle sanders, vertical sanders, disc sanders. The 5" and 7" sanders shown below have threaded male spindles, but the backing pad covers that spindle in the photo. Backing pads for these sanders are shown on the Pads for discs with center holes page. For additional sanders, please see our DA, random orbital , Inline sander , Palm sanders , and Pistol grip sanders pages. SAFETY WARNING: Make sure the RPM of the sander you choose below, does not exceed (is less than) the maximum RPM of any accessories you use with that tool. 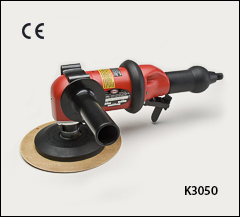 Unique 4" diamond disc sander allows operator to grind/sand flat FRP parts. Cutter can pick up 90% of dust with attached dust collection system. 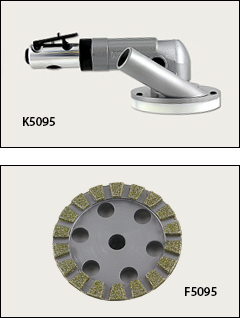 Cutter depth is adjustable from 0" to 1/8". Cutter sold separately. 23 CFM @ 80 PSI, 1/4" air inlet, 3/8" min hose size, 11" long, 5 lbs. 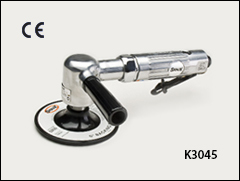 for the K5095 sander is sold separately. Sioux Force sander with lockoff lever safety throttle, built-in speed regulator, and a rear exhaust. Includes removable auxiliary handle and 5" backing pad. 4.5 CFM @ 90 PSI, 1/4" air inlet, 3/8" min hose size, 9.4" long, 2.9 lbs. 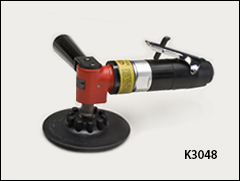 Sioux Signature Series non-governed right angle sander with lockoff lever throttle for safety and a rear exhaust. 35 CFM @ 90 PSI, 1/4" air inlet, 3/8" min hose size, 8.3" long, 3.5 lbs, 77 dB(A). Sioux Force right angle sander. Lockoff lever throttle. Support handle can be mounted on either side. Rear exhaust. 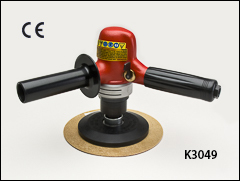 Backing pad for 7" abrasives included. 4.8 CFM @ 90 PSI, 1/4" air inlet, 3/8" min hose size, 7" long, 4.4 lbs. 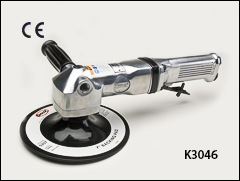 Sioux Industrial right angle sander with governed speed control, lockoff lever throttle for safety, and a spindle lock for fast and easy accessory changes. Governed tools perform better under heavy loads when they tend to slow down. They allow more air to enter into the motor to try to keep it at the rated speed. 35 CFM @ 90 PSI, 1/4" air inlet, 3/8" min hose size, 11.3" long, 6.9 lbs, 85 dB(A). Sioux Industrial non-governed vertical style sander with thumb throttle and side exhaust. Tool includes one spindle wrench, backing pad, and a pad nut. 38 CFM @ 90 PSI, 1/4" air inlet, 3/8" min hose size, 7.2" high, 4.1 lbs, 80 dB(A).